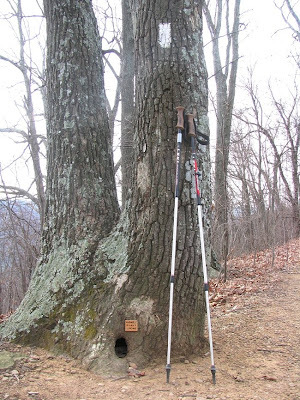 (picture above) A tiny tribute to someone who lives on the trail, and to the humor of someone who cared enough to post a sturdy, permanent trail sign at ankle height. If you can't read it, the sign says "Home Sweet Home". 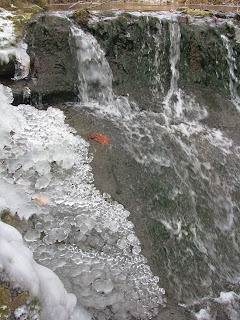 Old broken dam with ice accumulation from spatter, testimony to two consecutive days of temperatures continuously below freezing. Wild Water Cress abundant in the pools upstream of the dam. I couldn't help feasting on the free salad. Pastoral scenery for a change. It was great to be out of the woods and off the rocky ridges. The ridge in the background is called "Sawtooth Ridge" for obvious reasons. Half of today's 11 miles were on the spine of that ridge. The other half crossed three burbling streams, paralleled two of them, and provided constant variety. Other than the mouse hole, this was the highlight of Sawtooth Ridge: a rock wall with a garden-like accompaniment of Mountain Laurel bushes. Wading through knee-deep leaves, a distraction along Sawtooth Ridge, courtesy of the two days of strong winds, leaves drifted into 'dunes' over the trail. This had its pluses and minuses: Plus - felt like a kid playing in a pile of raked leaves. Minus - hidden 'stumbling blocks' -- unseen rocks and roots. A feeling of belonging: though it's very early days, as I crossed the open pasture land with homes in view, and realized that people in these homes could look out their windows and watch me and other hikers slowly progressing over hill and dale going from hither to yon, each with a rich personal story to tell, I felt I had come here to fulfill something that was meant to be - something almost sacred to me. I'm sure I'll elaborate on this more in future posts. It was a short trail day. I was off the trail at 2:30PM (got an early start at first light), so I had a chance to do some grocery shopping back in Daleville and to browse through the nice Outdoor Trails hiking and backpacking gear store, just for fun (no gear needs as of yet). 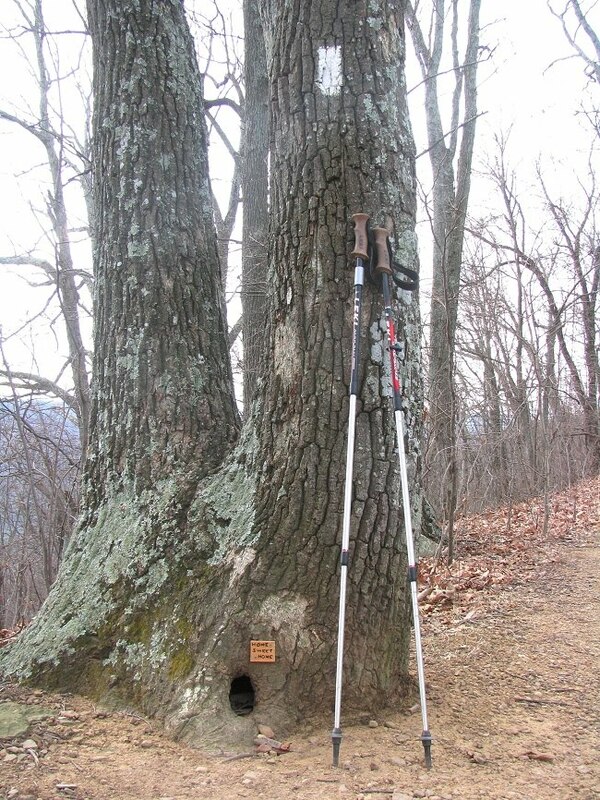 With today's hike, I completed 'Virginia Section 28', so designated in the official trail guides. Section 29 awaits, and promises lots more spectacular scenery. I'll be following your blog and rooting for you to reach your goal. Will you be sleeping in motels or camping at trailheads? Thank you for your interest, Michael. Almost exclusively I am camping in my vehicle - some place where I can get internet access.